103 in stock Need More ? Reprint. Originally published: London: Viking, 2001. *Soon to be a major film! 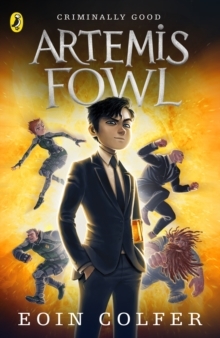 *Join the world of Artemis Fowl, the number one bestseller by Eoin Colfer. AT JUST TWELVE YEARS OLD, ARTEMIS FOWL IS A CRIMINAL GENIUS. No scheme is too dastardly, no plot too devious. And he's just discovered that fairies are real. Poor fairies. But these are not the cuddly creatures of bedtime stories. They are armed. They are dangerous. And when Artemis captures Captain Holly Short for her fairy gold, he messes with the wrong elf. Holly isn't armed but she's incredibly dangerous, and pretty annoyed with all the kidnapping. Artemis Fowl is about to find out that fairies fight back . . . Let the misadventure begin. 'Fast-paced, tongue in cheek . . . laugh-out-loud' - Sunday Times'A huge hit' - The Guardian'Artemis is a brilliant creation' - Anthony Horowitz***Winner of the WHSmith Children's Book of the Year Award and Children's Book of the Year at the Children's Book Awards.